Gary Rome Hyundai Dealer Blog - A Gary Rome Hyundai Site (888) 637-4279: Genesis SUV To Put The Bling On Hyundai Santa Fe? Hyundai’s luxury arm, Genesis, is about to release its first ever vehicle and it is known as the G90. The saloon will be competing with both the Mercedes-Benz S-Class and BMW 7-Series when released and it will also be one of the six vehicles Genesis is attempting to launch before 2020. The other vehicle from Genesis that is being developed is an SUV that is tipped to rival the Audi Q5 and the BMW X3. That moment when Genesis shared on the development of an SUV, we immediately imagined it to have a similar styling to the G90. 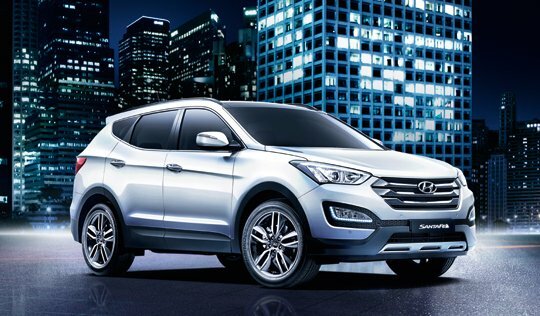 However, if the rumours are to be referred to, Genesis is going to utilize the latest Hyundai Santa Fe and give it a luxurious makeover. The Santa Fe will get its interior redesigned and Genesis will give the exterior a front grille and bumpers that are identical to the G90. When the Genesis SUV arrives, it will be running on the 246kW 3.8L V6 engine. There will also be the 272kW twin-turbo 3.3L V6 being offered with the SUV for those that desire more power. As exciting as this sound, it is still based on rumours so you should take it with a pinch of salt.